Henni lives in a world where old traditions and religion dominate. Unlike most in her village, she questions and wonders what the world is like as she comes of age. Striking out on her own, Henni goes out in search of truth, adventure, and more. 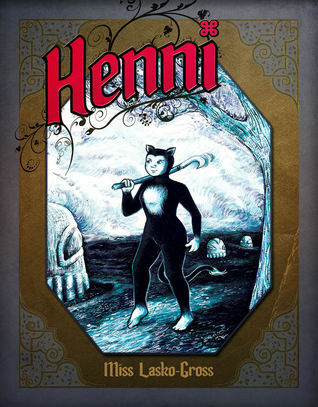 Henni is a graphic novel that portrays a society of cat people that are content to live a life devoted to a morally corrupt religious government. Henni grew up questioning everything, and as a result, she faces many hardships as she continues her path to finding out the truth. The setting had the feel of a dystopian novel but mixed with graphic novels and cat people. The character grows over the course of the story as she learns of the lies she has been fed as a child (despite at time doubting herself). The plot portrayed very relevant problems that many must face as they come of age. I received this for review from Net Galley. Henni is a novel that is fast and enjoyable to read. I did, however, feel that the ending was too abrupt and the story was not as long as I would have hoped. Despite that, the plot as well as the illustrations are creatively depicted.